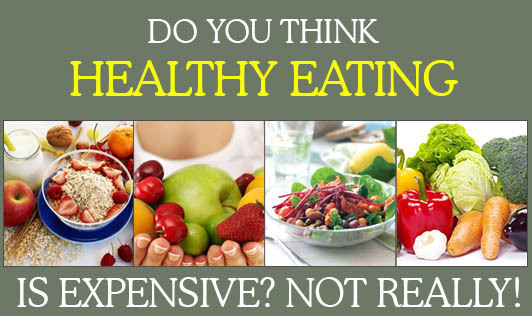 Do You Think Healthy Eating Is Expensive? Not Really! You all know that healthy eating is healthy living.The new research has shown that money earned is spent towards food, which sometime goes unhealthy by various means. Here are tricky ways to spare your savings account and keep your healthy eating at low cost, which on the whole give you adequate calories, reduces the lifestyle disease risks and keeps you energized and healthy. Buy seasonal produce: The fruits and vegetables may be expensive, but when it comes to health it does matter to consume it regularly. You can go for seasonal and perennial varieties like apples, bananas, lime and vegetables like tomatoes, potatoes, greens etc that are available round the year to meet your fiber, vitamin and mineral requirements. Prioritize food and eating: you can crack down on the poor eating habits and learn to cook on simple preparations which can reduce on food budget and also saves time. Do not go for unhealthy and time saving foods like processed, ready prepared once which are loaded with preservatives and calories. Shop locally: Buy foods at your feasibility and where you can bargain. Look for shops that give good discounts and offers. Purchase non perishables foods in bulk quantities that can save your resources. Slash your oil consumption: Prepare foods that consume less oil that will not change the taste of your recipe and also make you healthy. Use oil daily in recommended amounts and as suggested by nutritionists. Go with eggs: If you eat eggs, you are lucky to fulfill your macro and micro nutrients for the day. Substitute your non veg source to eggs to specifically meet your protein, vitamin, mineral and anti oxidant requirements and also to accommodate within your budget. Switch to water: If you are thirsty, substitute diet coke, colas, squash etc to water which are zero in calories and has many benefits on body's metabolism. The above ways are the basic building blocks of nutritious diet. Now do you think healthy eating is expensive?